“Strikes Delay U.S. Memorial to Jefferson,” Histories of the National Mall, accessed April 22, 2019, http://mallhistory.org/items/show/503. 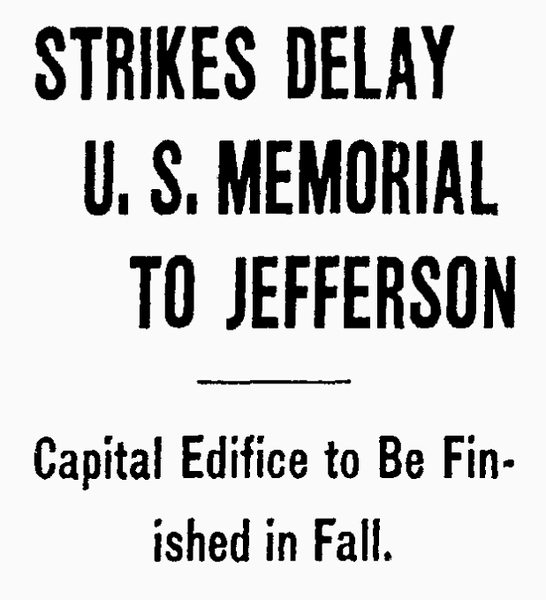 In June 1939, carpenters and laborers working on construction projects throughout Washington went on strike, including many building the Jefferson Memorial. Work on the Memorial and other public projects stopped for nearly 3 weeks due to the strikes. At the end of the strike, workers had successfully bargained for higher wages. Washington, D.C., Dec. 21 [Special] - Originally scheduled to be completed tomorrow, the 3 million dollar Thomas Jefferson memorial on the east bank of the tidal basin here will not be finished until next September, architectural experts said today. Delay in construction was ascribed to two strikes and to the fact that the work of filling in the seawall along the basin has been retarded because the contractor also is working on Washington airport. Because the airport is considered a vital link in the nation’s military preparations, it was decided that the labor and equipment needed on the Jefferson memorial would be better utilized on the airport. The memorial, however, is taking on its final lines, as columns are put into place and the dome completed. The building will be of pantheon design. Plans for it were prepared by the late John Pope, who also prepared plans for the Mellon Art gallery which is under construction a short distance away, on Constitution avenue. The architectural firm of Eggers & Higgins of New York City, has been supervising construction of the two buildings since the death of Pope in September, 1937. Surrounded by a peristyle of Ionic columns, the memorial contains a central circular room approximately 80 feet in diameter, with a dome ceiling. Made of limestone, the ceiling is entirely self-supporting, and is not connected with the outside section of the dome. The outer dome is made of structural steel encased in concrete with marble on top. Three artists have been working on models for the statue which will occupy the center of the large marble lined room in the interior of the memorial. The statue will be a heroic figure of Jefferson, on a great pedestal. The building will be a companion edifice to the Lincoln memorial, and will complete the five point design plan for the central Washington area, including the capitol, the Washington monument, the White House, and the Lincoln and Jefferson memorials. In the frieze of the main entabulature encircling the room, space will be found for inscriptions from Jefferson’s writings. On the four diagonal points there will be large panels, which will be well situated for other inscriptions or bas-reliefs of the events during Jefferson’s lifetime. A symbolic sculpture group will be placed in the center of the tympanum of the north portico. One of the objections to construction of the memorial was that nearly 125 Japanese cherry trees had to be moved or cut down. Altho the memorial will be completed next fall, it is expected the dedication of the statue of Jefferson will not be held until 1943, when it will be arranged to coincide with the bicentennial.